Our program began in Tempe, AZ. Our arrival was somewhat complicated by the fact that Arizona State University was playing a home game against the University of Southern California. The hotel was jammed with USC fans and our room wasn't ready until after dinner. But we settled in and got a good night's sleep before leaving the next morning for the South Rim of the Grand Canyon. This particular program was led by Northern Arizona University, which provides many of the Road Scholar offerings in the area. We didn't actually visit Sedona, but there are limited access paths onto the Colorado Plateau. 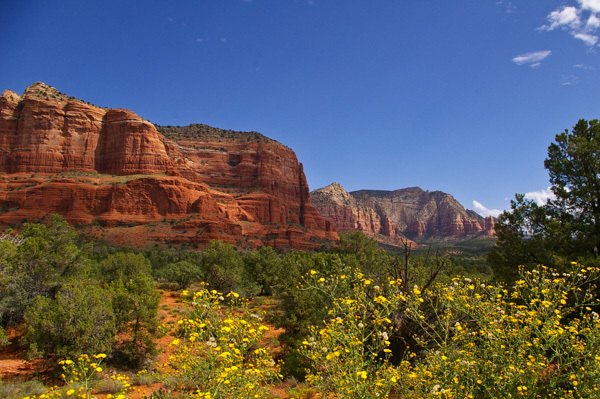 One of the most scenic travels through Sedona and the Oak Creek Canyon. Unfortunately we didn't have any photo opportunities in the Canyon. We left Phoenix (elevation about 1200 feet) in our trusty bus and began the long climb to the South Rim of the Grand Canyon (elevation about 6800 feet). Our tour guide, Bruce Banker, explained that almost all the life zones are represented in Arizona – subtropical rain forest is a notable exception – due to the vast differences in elevation. 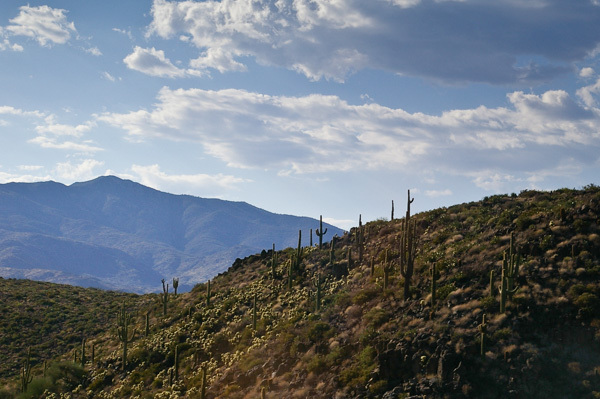 This particular zone north of Phoenix is the Sonoran Desert with saguaro and cholla cacti, among others. Our first stop north of Phoenix was the Red Rock Ranger District station. It was our first introduction to the colorful sedimentary rocks that we would see all around us as we proceeded to the Grand Canyon. This area is almost an oasis in the desert with a variety of vegetation including willows and cattails along the dry creek bed. 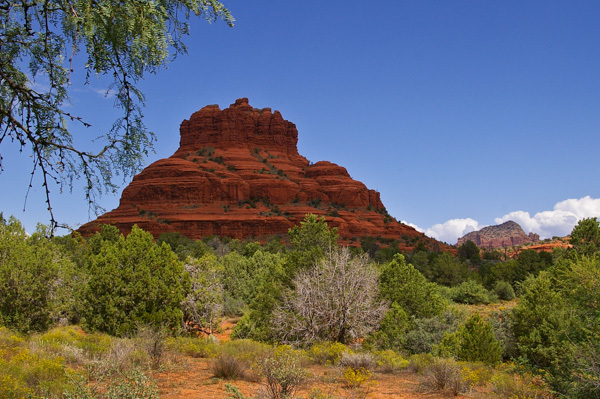 This formation is known as Bell Rock for obvious reasons. For reasons that are less clear to me, the formation on the left is known as Courthouse Butte. Bruce explained the difference between plateau, mesa, butte and pinnacle (or as he aptly called the latter, the "sticky-uppies"). 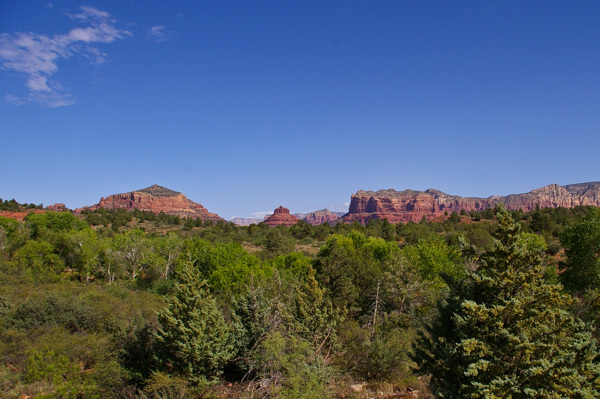 Our trip continued past Sedona, through Oak Creek Canyon, and onto the Colorado Plateau. As Bruce had warned us, the landscape changed about every fifteen minutes as we passed from desert through the pinyon-juniper zone to the ponderosa pine forest south of Flagstaff. Continue with us on our travels to the South Rim of the Grand Canyon.